You are currently browsing the category archive for the ‘Christmas’ category. Ok – finally – the table centerpiece for your Christmas breakfast table… this year why not try an edible centerpiece? Mandarin Oranges for an edible centerpiece! I call this Grandpa’s Granola because Grandpa says he can eat anything. Now as a family we smile knowingly as Grandma never cooked anything that Grandpa didn’t like. And 92 who is going to argue with him? I recommend you serve this with heavenly banana. 2. Thoroughly mix first five ingredients in a very large bowl. 3. In a saucepan heat oil, honey and vanilla until it bubbles. Pour into the Oat mix and stir thoroughly. 4. Add the nuts and seeds and continue to stir until it is well mixed. 5. Spread out on two large baking sheets (with sides). 6. Bake for ten minutes, turn granola in to the center then spread it out again. Do this two or three times until the Granola is turning a golden brown and looks dry. CAUTION: Watch closely during the last ten minutes so it doesn’t burn. 7. Remove from oven and continue to stir (so it doesn’t clump) until it cools. 8. When cooled add the dried fruits and mix thoroughly. Store in a sealed container. 3 cups Cranberry, Apple or White Grape Juice. All you have to do is: Mix together and refrigerate until chilled. Garnish: Float raspberries, lime or orange slices and sprigs of mint. This recipe is one of my Dad’s favourite recipes to prepare for his guests. He finds it quick to toss together, easy to make, and his guests always love it. In a large bowl whisk eggs, pukka sauce and salt together. Stir artichokes, pimentos, and cheese into the mixture. In a 10 inch non-stick saucepan with oven proof handle over medium heat, add oil and garlic, and sauté for about 2 minutes. Careful not to burn the garlic – stir frequently. Stir the olive oil and garlic into the mixture. Place in oven and bake for 18 to 20 minutes until centre is set and top is browning. If the egg is cooked but not brown, place under broiler for 2-3 minutes until browned. Cool for a few minutes, then with a spatula go around the edges to loosen the frittata. Put a large, warm plate on top of the pan and flip over quickly. With another warm plate, cover and flip again, so the side with the browned eggs is now facing up. Cut into wedges and garnish by sprinkling cheddar cheese over top and placing one slice of a red or green pepper on top. Serve with salsa and multigrain toast. Anyway … in case you haven’t figure it out … it’s Julie writing today. Mom is busy with her holiday decorating! The main floor of her house is covered in boxes and decorations. It’s definitely starting to feel festive in a chaotic sort of way!! This brunch menu is sure to win the crowds over this Christmas. I hope you give a few of the recipes or maybe even the entire menu a try. Make these in advance and freeze. Take them out the night before you want to serve them, let stand for 1 ½ hours. Put in fridge until morning. 1. In a large bowl, dissolve 2 teaspoons of sugar in the warm water. Sprinkle yeast into water mixture. 2. Let stand 10 minutes, and then stir well. 3. Add warm milk, sugar, salt, butter and eggs to yeast/water mixture. Stir in 3 cups of flour. Beat vigorously until smooth and elastic. Scrape sides of bowl. 4. Add remaining 2 ½ cups of flour gradually. 5. Roll the dough into a ball on a floured surface. Knead for 5-10 minutes or until dough is no longer sticky. 6. Let the dough rest for 20 minutes wrapped in Saran Wrap and a towel. Punch dough down. 7. Roll out dough (rectangle) to approximately 15 inches long 10 inches wide. 8. Brush with soft butter, sprinkle with cinnamon and pecans and roll into long roll. Cut into 1 ½ inch slices, put each slice into large muffin pan to freeze. At this point they can be frozen and then taken out the night before you wish to cook them. You would take them out the night before, let stand for 1 ½ hours and then refrigerate overnight. In the morning, bake @ 350oF. Before you bake, arrange them on top of the Caramel Pecan mixture in the Christmas Tree pan, or pan of choice. 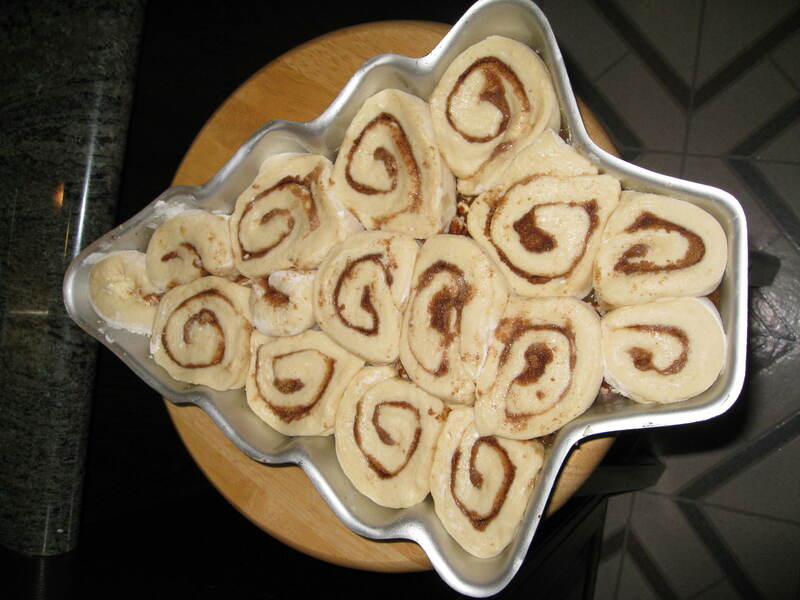 I make this in a Christmas Tree shaped pan the night before, add the frozen cinnamon buns and refrigerate. In the morning cook and serve for breakfast. Spread mixture in the bottom of the greased pan then sprinkle with chopped pecans. Place the buns on top of the mixture in the pan. 10. Place in refrigerator and cool for 2 – 24 hours. Remove when ready to bake them. Uncover. 11. Let stand for 10 minutes at room temperature while preheating the oven to 400°F. 12. Using a toothpick pop any bubbles that may have formed while cooling the dough. 13. Bake for 28-30 minutes if baking them in a muffin tin or 35 minutes in the tree pan until brown. Make sure the center buns pop back. Make sure they are cooked before taking them out of the oven as oven temperatures vary. 14. Remove from pan and cool on wire racks. 15. 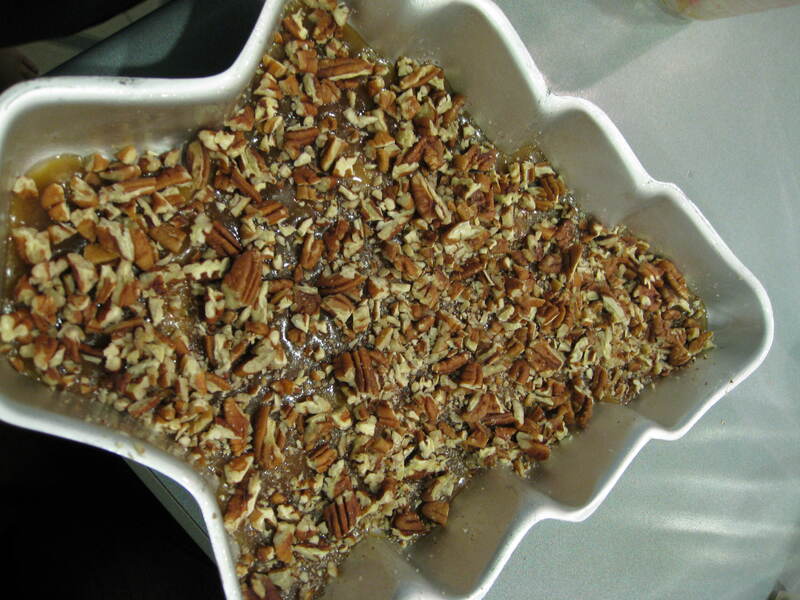 If using the Caramel & Pecan Topping, remove from oven and immediately invert onto a large tray. Scrape out excess syrup and pecans and add to top of buns. Serve immediately. 16. If not using Caramel Topping, brush with melted butter if desired, serve warm. Tomorrow is the first day of December and for me, that signals the time to begin preparations for the Holiday Season. I always looked forward to December the 1st as that was the day we put up the tree. It meant the beginning of Christmas decorating, baking cookies, pouring Amaretto over the Fruit Cakes (and taking a sip!) wrapping gifts, and generally getting ready for the family and friends that would share the seasons festivities with us. I am a bit behind this year as I have a cold, but I will at least be thinking about what I will do. My preparations always start with a list. Rick rolls his eyes and says I make lists of my lists, which is true because I need to keep myself organized! First I need a theme – well that is easy as it is Christmas so the colors are red, white and green or a derivative. This year I will be using the Christmas Tree as my main focus. My first set of lists is for the Christmas Eve Dinner, the Christmas morning breakfast, a snack list, beverage list and dessert list which will generate my food shopping list. And so it goes, five lists to make a food shopping list! Speaking of Christmas lists… we can help with your shopping list!! We are offering 40% off our gift certificates until December 10th so if you want to give someone you love a night or two of pampering then send them to Annes Oceanfront Hideaway (or if you just want to buy it for yourself to save the 40% that is ok too… we won’t tell!!). The only catch is that it must be used up before the end of March, 2010. Thanks for the nudge about Valentine’s Day Decorating June. I hope you can find some ideas here to help you get started. Have a nice time at your party! We celebrate Valentine’s Day for the month of February at Anne’s. We add a few extras to the room amenities and offer a couple of different special packages for a two night stay. This gives our guests a chance to settle in, enjoy a relaxing tub for two and a special breakfast each morning along with time to explore the island, enjoy a wonderful dinner at one of many gourmet restaraunts and return for a relaxing evening with a glass of wine by the fireplace, perhaps a movie and popcorn, and/or another tub for two! It is a nice getaway from the hustle bustle of family and work and gives them time to devote to each other. Of course for us that means two separate delicious breakfast menus to work up! So I will get started on that this week. Have you noticed how sometimes the decor takes a turn. “Things” turn up on the table when you least expect them………to help or hinder..? You be the judge! As I walked around the house gathering I realized I only have bits of red, and some is used at both Christmas and Valentine’s. The bonus is the days are close enough together the reds are not lost in the back of the drawer by the time Valentine’s comes along. A splash of pink with the red and white looks nice as well. Flowers are always a nice addition especially red and white roses, or red and white carnations. Flowers, chocolates and a special someone to share them with. Delightful! Here are a couple of other ideas to help you get started. Begin with a few basic choices then start adding and subtracting objects until you find a look you like. Remember to keep it fairly low so people can talk across the table comfortably. Also remember that a variety of textures and shapes and a splash of a different color are usually more interesting. Unless you are going for a very ultra modern look when less is better, add a variety of shapes and sizes. Did you know the pink quartz is also called the heart rock. What a great way to bring in texture! Consider adding a couple of candles. A couple of other tools that may be of use. Some are used in making the breakfast, others are used on the table and others can add to the presentation and complete the theme. The cookie cutters in the first picture can be used to cut many different foods such as ham slices, toast, scones, etc. The black cutter is for shaping eggs while they are cooking..
heart shaped chocolates, cinnamon hearts, flowers or sliced strawberries. A red heart shaped bun basket. I will be putting up a Valentine’s Day Breakast Menu in the next week or so. I need to bake the goodies so I can put some pictures up for you. When I do that I will do a table setting so you can see the complete picture. I have a dear friend who is passionate about roses. What better time to let you know about her blog which is full of the beautiful pictures of the roses she grows. Thanks Pauline! Christmas Brunch Menu and Preparations! Today’s the first day of winter…and what a winter day it is indeed! Here on Salt Spring Island we’re covered in a blanket of snow that just keeps on falling. Good thing we’ve nowhere to go today because we are not going to be able to get out of our driveway. Tomorrow we’re sending out the final Christmas brunch recipe to our Breakfast with the Broads email recipe subscribers. They’ve now got everything they need to prepare an amazing five course brunch…and today I’m going to share with you how that brunch can be ready to go Christmas morning with less than an hour of work! should be made ahead of time! And you could even make the bread basket items up to a week in advance, store them in the freezer, then just pop them in the oven for a few minutes to warm them before serving! If you do that… you can have brunch on the table in less than an hour, and have time to visit while things are cooking. Bake the Almond Berry Bread and Orange Cranberry Muffins. Let them cool completely. Freeze the muffins in a large freezer bag or freezer friendly sealed container. You may actually find that the bread is either to slice frozen because it’s a bit crumbly, so freeze it whole if you’d like then slice it as it thaws the morning of brunch. Make the Apple Berry Crisp and the Salmon Strata – but do not cook! Once they are ready to go in the oven, cover them and put them in the fridge until morning. Make the fruit compote as per the instructions and put it in the fridge too! If you really want to sleep in, set your brunch table the night before. That way you will have very little work to do in the morning. Pop the crisp in the oven and start baking it. Since it takes about 35 minutes, and you’ll serve it about 15 – 20 minutes before the strata, you want it ready first. Take your bread basket items out of the freezer and leave them on the counter to let them thaw a bit. Slice the bread if you froze it whole. Get coffee and tea ready. You can also fill water glasses and get the table set (if you didn’t do that the night before). Prepare the compote (you will need to make the lemon cream). Put a compote and a juice drink at each table seating. Once the crisp is ready, pull it out of the oven and put the strata in.You want to let the crisp cool a little bit before serving. Pop the bread basket items into the oven for no more than 5 minutes. Pull them out and put them in a basket with a tea towel wrapped around and over top of them to keep them warm… now it’s time for brunch! Seat your guests around the table, serve them their coffee and tea. Allow them a few minutes to get settled and start enjoying their compote. Put out the fresh baked bread basket items 😉 – hey, they ARE hot out of the oven, aren’t they? If your strata still has more than 15 minutes to go in the oven, take time to sit down with your guests and enjoy the compote and bread basket items. Once your strata has less than 15 minutes left in the oven, scoop out the crisp into individual servings, add a small scoop of yogurt and a mint leaf. Serve these to your guests, and take 10 minutes to enjoy yours too! When the timer goes for your strata, take it out of the oven and dish it up right away. You want to serve this hot from the oven. Brunch and Breakfast Recipes Weekly! This post is sponsored by my Breakfast with the Broads Cookbook Website… head on over to sign up for our weekly email recipes AND you’ll get a fantastic Brunch Planner complete with menu ideas, shopping lists, and of course, recipes! Perfect in time for your holiday visitors!! Sit down and enjoy the praise from your guests that you pulled off a 5 course brunch in less than an hour!!! Christmas is such a busy time around the house. Between guests visiting our Bed and Breakfast and our family visitors, there often isn’t much time to worry about decorations. So, I admit that I typically just grab what is handy and set up the centerpieces that are the quickest to do. Keep the centerpiece low so that people can still see each other and make eye contact over the centerpiece. Use some seasonal colours like gold, silver, green or red so the decorations on the table easily tie in with the decorations around the rest of the house. Use things that will appeal to the people at the table. If it’s adults only then I will use more sophisticated decorations but if there are going to be kids around the table I will tie in little ornaments that are appealing for kids like Santa figures, Elves or little snowmen. So once you have an inventory of what you can use, then I am sure you will get even better ideas than these, but here’s a few of my favourite fast table centerpieces that really pull a room together and fill it with the Christmas spirit. This is really quick, simple and quite effective. You can use any color of shiny ball or even the string balls that are so popular this year. Fill the clear dish with some of the beads then add the balls, add more string beads, alternating until it as full as you want it.You can leave it at that or add other toppers or candles. WARNING: I used real candles a couple of years ago and spent hours picking off the wax so I suggest either the battery operated candles with just the the tip sticking out or putting candles on either side. One more really fast table centerpiece ideas for you… use an inverted cake server. 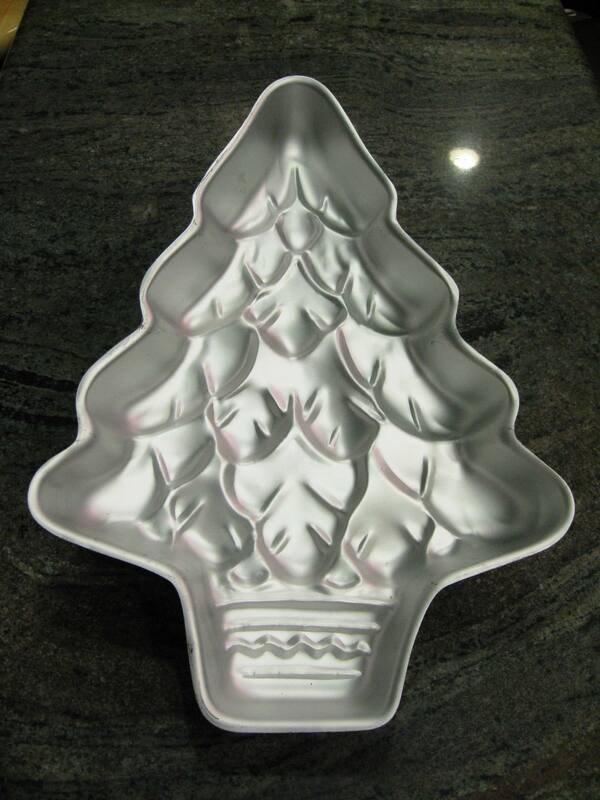 In the top section (which is normally the bottom of the cake server) put a candle (if real use one of the 2-3″ diameter, 8-10″ in height so it will burn all during dinner) or some other Christmas decoration. Surround it with coloured Christmas balls. On the lower section add some greenery – I used artificial for purposes of demonstration but live is much nicer. I used a glass grape cluster but the possibilities are endless. If there are children you may want to add a small Santa, miniature toys or something appropriate. If you have holly, fill the top and bottom with holly and just a couple of small balls or none at all. I hope you have a beautiful, warm and wonderful holiday season. Brunch planning tips, theme ideas, menus, shopping lists and recipes all free in the Breakfast with the Broads Brunch Planner. Sign up and get a new recipe every week by e-mail. Breakfast will never be boring again!